Nationalism as proposed by Indian National Congress formed in Calcutta in 1885 was seen as a threat by leaders of the Muslim community of India, who gathered at Aligarh in 1886 at the call of Sir Syed Ahmad Khan. With consensus, they founded Mohammedan Educational Conference. Despite dictators and tyrants (foreign and local), the people have kept this routine. And no other moments in between - elections, political movements or unrests - match these "peak moments" as occasions when everyone wants to give an opinion about where the nation should go. You can find out more about Sir Syed Ahmad Khan at Wikipedia. Next: Muhammad Ali Jauhar, a disciple of Zafar? 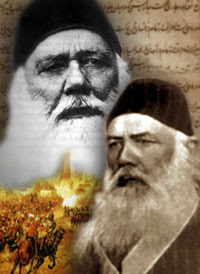 Sir Syed Ahmed Khan was the pioneer who urges the muslims of subcontinent a separate identity. He compete the britishers and hindus with the weaon of education and made the first Muhammadan Educational Institution for muslims in eightees..
As described, this nation unites and give its fresh verdict after every 20years for its future course. Now its the time to wake up and to learn from our past mistakes and blunders and revive the history in a new style that leads to the vision of Iqbal r.a and marghadeen should be our destination. We have to come out from the impacts of secretarian, nationalism, hatred from others and bring the peace, cleanliness, patience and helping each other that should be owned. The coming time is more critical than the earlier one so we have to think seriously and move. Thank you very much for this post on this intriguing key figure in the history of Pakistan.